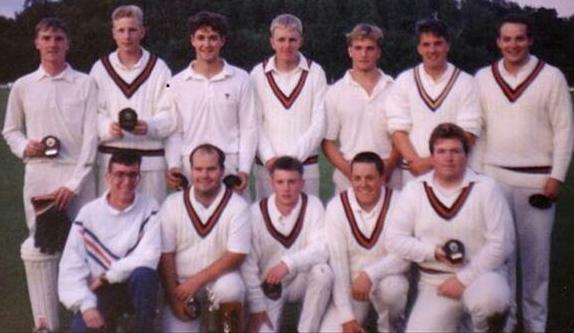 Ok, oldtimers , here is a slightly grainy picture of a St.Georges U21 XI from the 1990 season. Kindly supplied to me by Steve Pessall. The picture was taken after St.Georges had beaten Bridgnorth in the final of the U21 KO. If you have any pictures from the past please send them in so that we can add them to our gallery. This entry was posted on May 8 at 8:13 pm, and is filed under Club News. Follow any responses to this post through RSS 2.0. Both comments and pings are currently closed. Is tony hyde still around telford? Nearly right – one player missing! wayne peel,martin crompton,gareth howells,gary sherwood,dean griffiths,andy reeves,pessall,paul smart,ian ward,neil jones,andy hyde.